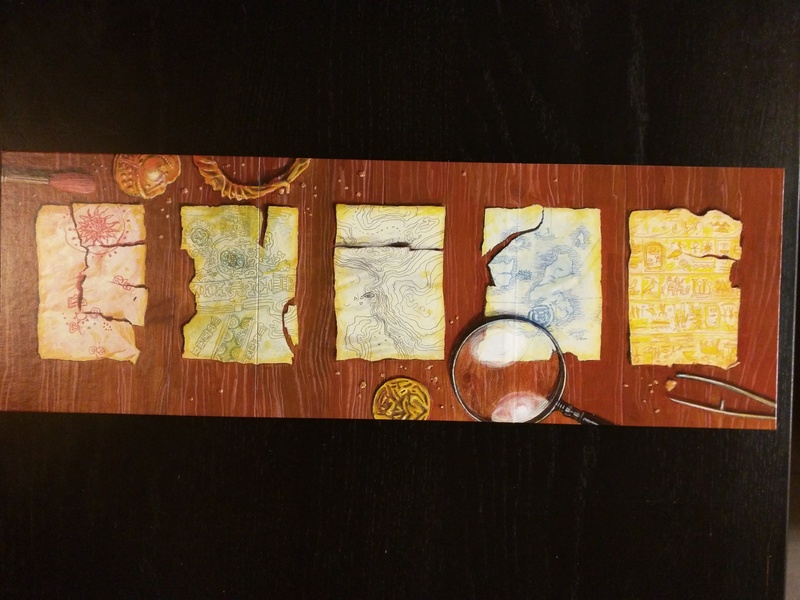 Lost Cities is a fast, easy to learn 2 player game about being an archaeologist and going on expeditions to different areas of the world. 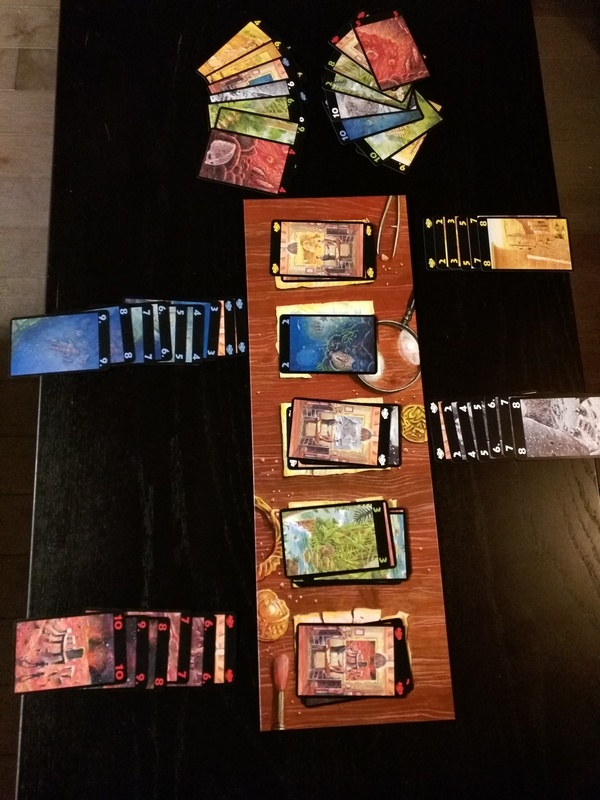 It’s got simple mechanics, but it still has a bit of strategy to keep you interested. It only plays two, so it is a potential perfect game for couples! 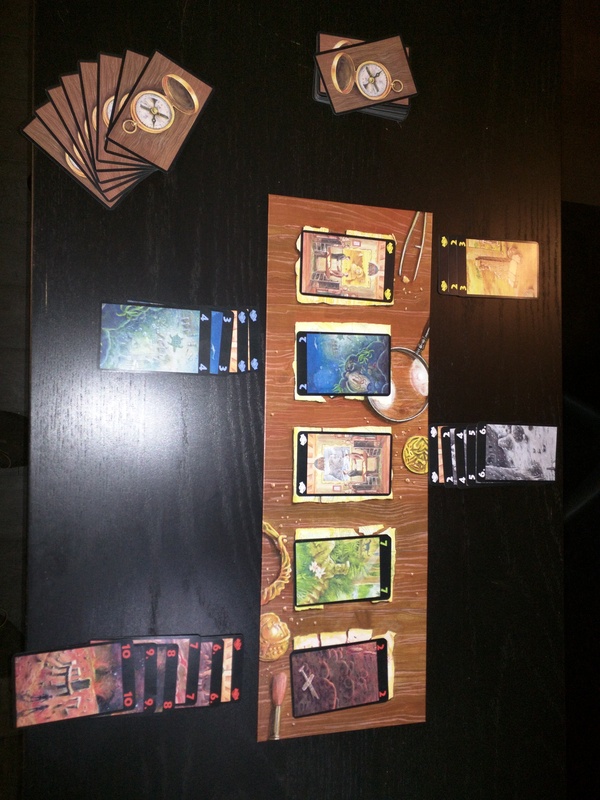 The board goes horizontally between the two players, so it’s ideal if you’re sitting across from each other. Shuffle up the cards (which is actually kind of hard if you have small hands, because they’re larger than normal cards), and then deal 8 to each player, face down. Put the rest of the cards face down to form a draw pile next to the board, and you’re ready to go! On your turn, you have to do 2 things. First, you must “play” a card. The reason I say “play” is that you can either put the card on your side of the board to start or continue an expedition, or you can put it on the actual board (matching the correct color), kind of like a discard. The second thing you must do is to pick up a card from either the draw pile or from another place on the board (you cannot pick up the card you just “played”). This way, you will always have 8 cards in your hand. Now, there’s a few rules with regards to playing cards, you can’t just play them any way you want! Note there’s two types of cards, investment cards (which are denoted by a handshake icon), and simple point cards, with value ranging from 2 through 10. When you play an investment card, it must be either on an empty expedition, or on another investment card. When you play a point value card, you must either play on an empty expedition, on top of 1-3 investment cards, or on a lower value point card. For example, if you play an 8 on an expedition as the first card, the only other cards you can play on that expedition will be the 9 and 10. The game immediately ends when the last card in the draw pile is gone, and you’re allowed to count how many cards are left to plan out your moves. Keep in mind this means that there will be at least 16 cards that will never be able to be played (8 for each player in their hands). No one wanted green, I guess the jungle didn’t have an interesting enough expedition…or maybe just too many insects. I feel like this is kind of the drawback of this game; it’s not immediately apparent who won, as figuring out who wins is a pretty time consuming calculation. Lets go over exactly how to score the game, first. If you don’t play anything on an expedition at all, that expedition is worth 0. Doesn’t sound good, but if you only play 1 card, no matter what it is, the starting value for the expedition is -20! This means you shouldn’t play your green cards just because you have a lot of them (as we found out on our first playthrough when we decided to not worry about scoring until the end). Add up all of the number cards. Lets say you have played a 2, a 3, and a 6. That’s a total of 11. Subtract 20 from that total, so now we’re at -9 points. Oops. Mistakes were made. Lets say for the sake of example we played 2 investment cards as well before playing our 2, 3, and 6. Now we’re at -27 points for this expedition. Ouch! If you’ve played 8 cards or more on a single expedition, congratulations, you get a 20 point bonus for that expedition! So, it’s wise to sometimes just “play” (read: discard) cards to the board instead of using them for your expeditions, because otherwise you could potentially be in the hole! However! We’ve created a calculator that helps you figure out your final score. The full instructions are on the linked page, but you can just click on the cards you have and you’ll get your final score at the bottom! The playtime is listed at around 30 minutes, but that’s only because the rulebook suggests playing multiple rounds and adding your scores together to see who the real winner is. If you just wanted a quick game, you could only play 1 round and it would take probably about 5-10 minutes. I could also see it being played like a “first to 500” kind of thing as well if you like to play that way to lengthen the game time. Remember that the investment cards can only be played before putting any number cards down, so if you see your opponent start building on a color, you can safely discard those if you need to get more cards in your hand without playing your own numbers. We’ve found that usually one person goes for one or two colors, while the other person goes for a different one or two colors. It seems like for us at least, it’s pretty rare to see 3 colors built up. Of course, if you know that someone is going explicitly for one color you could hoard that color so make sure you’re diversifying a little bit! The green 7 is tempting, but remember if you can’t make at least 20 points on a color, it’s actually working against you. In this case I needed to focus on the blue so that I wouldn’t get a bunch of negative points! 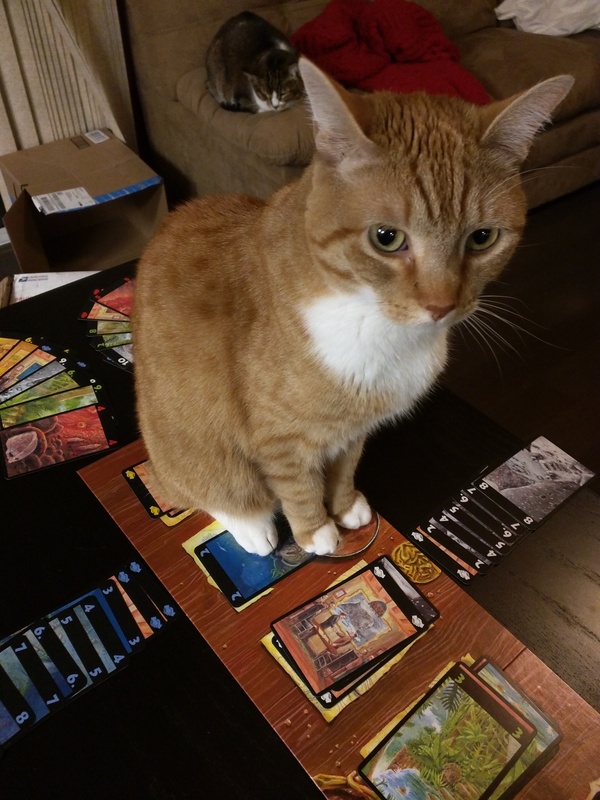 You can pick up cards that you previously laid down, you just can’t do it the same turn. This can work to your advantage if you stack the cards right, because if you’ve just “finished” building out a color but you dumped all of a different color to do it, you can start putting the junk in your hand onto the board and continually picking up the color that you stacked. Of course, your partner will likely notice you doing this and try to take some of those cards too. Keep in mind the game ends when the last card is drawn, with no other play after that card is drawn. So there will always be at least 16 cards that don’t get played. You are allowed to count the number of cards left in the deck, and you can prolong the game a bit by drawing from the board instead of the deck, even if the cards you pick up you know are just going to be worthless. There’s a fairly big element of luck in this game, being a card game and there only being one card of each point value for each color. It feels a lot like gin rummy in that if you draw a card you need or your opponent needs, you can play around that and force yourself into a better position. Meanwhile, if they draw garbage, you can really skyrocket ahead. I think it’s best that multiple rounds are played, as this will help to smooth out the luck factor. The strategy here isn’t very deep, it’s mostly about denying your opponent the cards they want while trying to get the cards you want. Playing cards on the board instead of your side at the right time can be extremely beneficial, as it serves to stall the game a bit and give you some time to get other expeditions set up. That’s about where the strategy ends though unless you get really deep into mind games with your opponent, but I feel like a lot of 2 player games can do that. The art on the cards is pretty nice, each increasing number shows a more progressive expedition, for example the 2s are usually kind of barren and the 10s look more like a fully fledged civilization once lived there. The only thing I don’t think fits the theme is the scoring, it’s just too much detracted from the rest of the game. Hey, this isn’t a 3 player game! Besides, every cat I know wouldn’t go on an underwater expedition either! There’s not a ton of interaction, and sometimes it feels like you’re just playing two player solitaire with the added benefit of being able to use cards discarded by your opponent. That said, it can be very satisfying either taking or burying a card you know your opponent needed and thwarting their attempts at building up their expeditions. I would put this on the same amount of replayability as most other regular card games like rummy or crazy eights. There’s enough luck that no two games will be the same, but on the other hand, they will feel very similar just due to the limited number of choices you can make. I would say this game is very light, aside from the scoring. However if you use the calculator we made, then overall it is extremely light. I like the art style, it does feel very appropriate for the expeditions that each color represents. The board itself is kind of hard to see the colors on (at least for me, being red/green colorblind), so when playing directly to the board, I always have to look twice unless there’s already cards out there. It’s only cards and a board, so there’s not too much to comment on, although the cards are larger than normal cards, so that could be good or bad depending on how large your hands are. I do like that the box has an insert that the cards fit into nicely, so even if you store this game vertically, they won’t fall out. Overall, though, the cards don’t seem to be any thicker than normal, and if you want to sleeve them, it might be harder to find the larger sleeves. 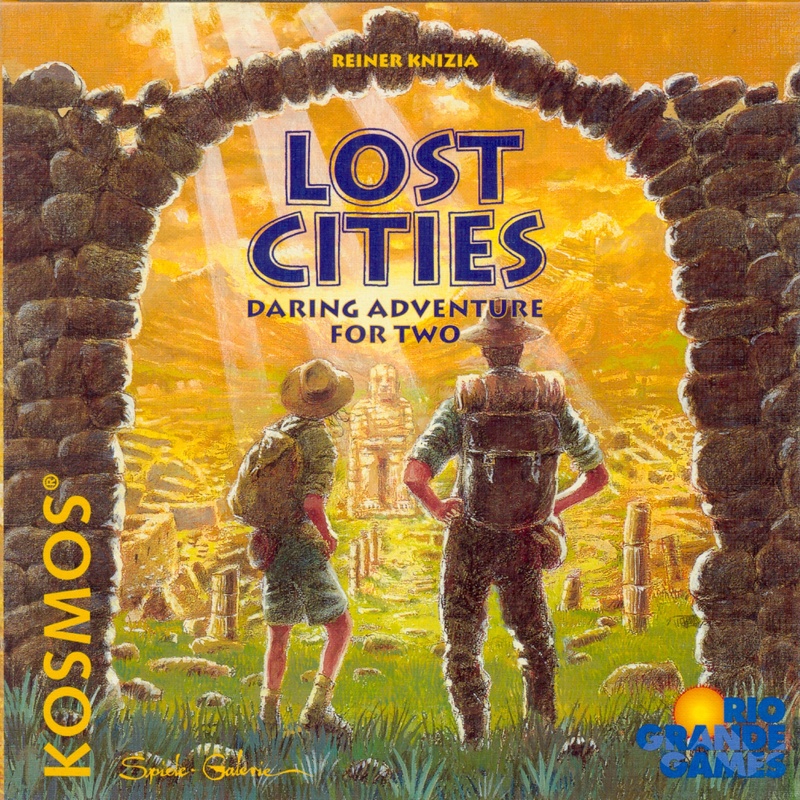 Lost Cities can regularly be found for under $20, so I’d say for what you get, it’s a decent value. Realistically, they’re probably making a lot of money for just a box, insert, board, and cards, but the art and design are really what you’re buying here. It’s fun, but overall it just feels a bit too familiar. I want to feel like I’m playing something different. The art helps a bit to get more into the world of expedition-ing and having a huge stack of one expedition does feel cool like you’re building up the civilization. For me (Erik), though, there just aren’t enough new mechanics that make it feel much different than playing with regular cards. That said, I’ll still play it if suggested or if I want to introduce someone to a quick 2 player game.